As part of the SCX Group, Burnand XH is able to provide a complete range of control gear for cranes and overhead lifting equipment. The group’s expertise in bespoke mechanical handling solutions as well as the servicing, repair, modernisation and relocation of overhead cranes and lifting equipment, means we have a greater knowledge of the control requirements for mechanical handling and lifting equipment than many of our competitors. Through the SCX Group companies, we are able to install complete mechanical handling solutions to maximise the performance of your lifting equipment, reducing downtime, improving plant safety and increasing productivity, and we are able to offer unbeatable discounts on many Street Crane products. Sometimes referred to as "overtravel limit switches" these devices are designed to carry the main power supply to the machine. They can be arranged to firstly slow the machine as it nears the limit of travel, and then to stop the machine when it reaches the limit; here the main supply is broken by the switch contacts, thus causing a complete stoppage. These switches are ideal for ensuring the safe operation of heavy mechanical handling equipment, such as cranes etc. Ultimate limit switches are positioned to provide a backup safety system whereby, in the event of the first limit switch failing, they serve to break the power supply to the machine, bringing it to a complete stop. Once the ultimate limit switch is tripped, the machine cannot be driven until the system has been reset and confirmed safe for use. These devices are mainly used at ground level for control of moving tackle such as hoists, small travelling cranes, overhead cranes etc. They comprise devices such as pushbuttons, key switches and signalling devices. Joystick controllers are mainly used for control of movement on one or two axes via an intermediary contactor, e.g. for movements of translation/direction or raise/lower on equipment such as cranes. They generally support 2 to 8 directions and can comprise several contacts per direction, with or without return to zero position. Certain types of joystick controller can be fitted with a 'dead man's' contact in the operating lever. Special joystick controllers can be manufactured to suit your application. As well as offering flexibility and freedom, remote control units can also improve safety, reliability and even contribute to the operating characteristics of your crane functions by automating certain processes through their programmable functionality. 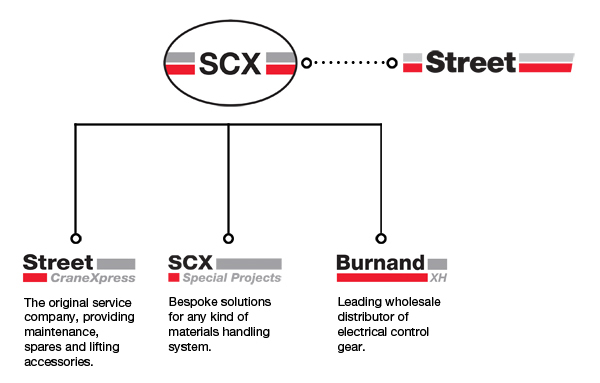 As part of the SCX Group, Burnand XH can offer unbeatable discounts on the Street Crane range of remote control units, with Street CraneXpress providing the integration of these units through conversion of your current systems. 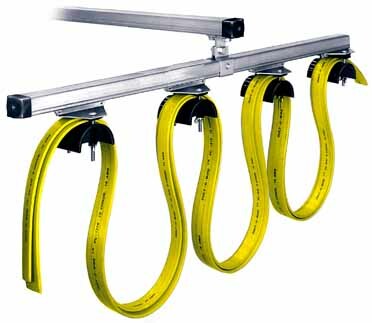 Cable or hose festoon systems provide a safe & economical means of supplying power to cranes, hoists and moving machinery travelling along fixed tracks. They are suitable for carrying flatform cables, roundform cables or flexible hoses supplying electrical current, compressed air, gases and liquids. - Insulated single bar systems based on options of galvanised steel or copper conductors. Both formats are ideal for use on electric overhead travelling cranes and monorails. For all your power system requirements, contact the friendly team at our sister company, Street CraneXpress. Get in touch today to discuss which of your Street Crane parts we can supply.